Nearly 7 million people of working age in the UK are disabled or have a health condition. There has historically been a large gap between the numbers of disabled people employed compared with non-disabled people. Through the Disability Confident campaign, the government is working with employers to remove barriers, increase understanding and ensure that disabled people have the opportunities to fulfil their potential and realise their aspirations. Employers are crucial to improving employment outcomes for disabled people. 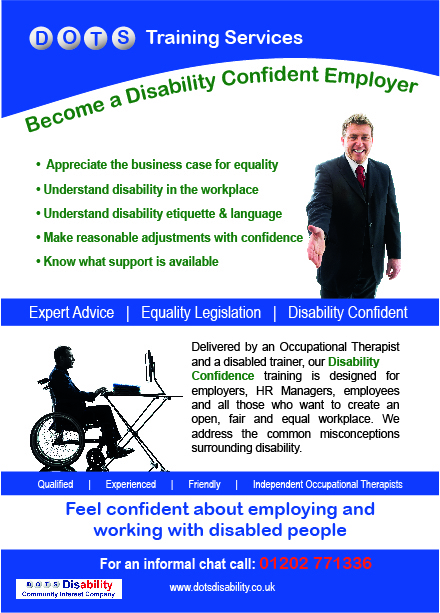 DOTS Disability are offering businesses the opportunity to attend a one day training course to enable them to become “Disability Confident” on Monday 15th February 2016 or Friday 4th March 2016 at the Village Hotel in Bournemouth. We will address the common misconceptions surrounding disability and discuss the business case for equality. 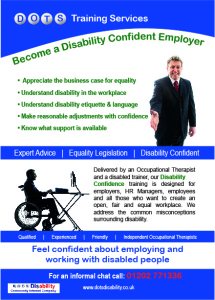 The course will cover disability etiquette and language, provide an understanding of disability in the workplace, making reasonable adjustments with confidence and knowing what support is available. 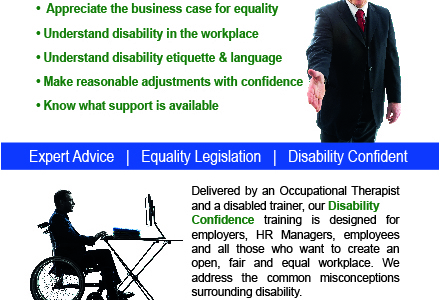 Delivered by an Occupational Therapist and Disabled Trainer, the training is designed for employers, HR Managers, employees and all those who want to create an open, fair and equal workplace. This invaluable training course costs just £130 per person plus VAT and includes lunch. To book your place or for more information, please contact Gemma Hallifax or Odile Waddington-Jones on 01202 771336.